A Saturday full of entertaining hockey courtesy of your New York Ranger and New York Islander prospects was exactly what the weatherman ordered for those of us who are snowbound at the moment. A total of 14 games from coast to coast took place and there are some happy and a couple of embarrassed folks out there. One area where the New York Islanders are going to have plenty of talent down the road is going to be on the blueline as while many are raving about the twin first round picks playing in the WHL, there is a 3rd defensive prospect who has quietly worked his way up the ladder towards a possible Islander jersey. Adam Pelech (NYI 2012 3rd) doesn't get the notice that either Griffin Reinhart or Ryan Pulock do but do not discount Pelech as a future Top 4 defender. Pelech earned himself the game's 3rd star with a 1-2-3 +4 performance to help his Erie Otters earn a 7-2 win over the London Knights. It was a rock solid 2 way performance from the 6'2 220 defender as he leads an Erie blueline that has given up the fewest goals in the OHL so far this season. They really do need a stat to measure when a player makes a good defensive play as Pelech had at least 5 good ones. Pelech had 2 secondary assists to go along with his 9th goal of the season and Pelech is a career best 9-36-45. The captain of the Regina Pats Kyle Burroughs (NYI 2013 7th) did exactly what you want to see from your team leader when your team is needing a big win. 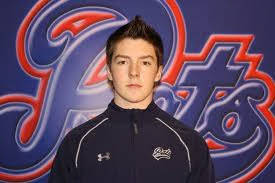 Burroughs earned the game's first star with his own 1-2-3 night to lead the Regina Pats to a 7-3 win over the Saskatoon Blades. The Pats needed this one in order to stay in step with the Brandon Wheat Kings and Swift Current Broncos for first place in the WHL's East Division and the 2nd seeded spot in the WHL's Eastern Conference. Burroughs got the Pats going when he set up Dyson Stevenson for a power play goal just 2:03 into the first period and a 1-0 Pats lead. Regina added a goal before Burroughs would score his 6th goal of the season to give Regina a 3-0 first period lead. It turned out to be a huge goal as Saskatoon would score 22 seconds after Burroughs did to get back into the game. In the 3rd period Burroughs would add a secondary assist on what was Regina's 6th goal of the game. It was Burroughs 28th assist but his 34th point which along with his 6th goal are new career highs. More importantly this win allowed Regina to remain just 1 point behind the Brandon Wheat Kings in the race for the East Division title. The winner will get the 2nd seed while the loser could find themselves as the 7th seed. 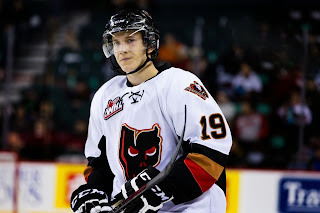 If there was any question as to whether Adam Tambellini (NYR 2013 3rd) made the right move by jumping to the Calgary Hitmen then your answer can be found in looking at what Tambellini has done in his last 3 games. 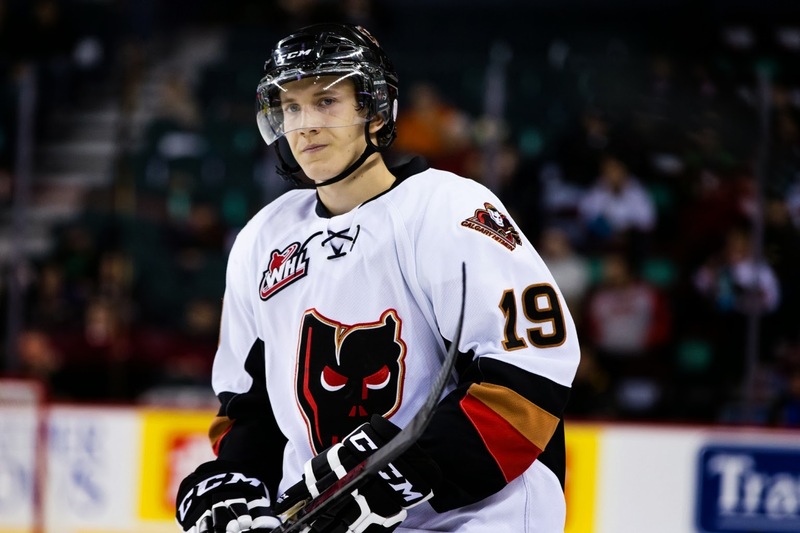 Tambellini with a goal and an assist made it 3 straight two point games as his Calgary Hitmen defeated the Kamloops Blazers 3-0. The win was Calgary's 3rd straight and allowed them to remain 5 points behind the Edmonton Oil Kings (winners of 10 straight). Tambellini earned a secondary assist on Calgary's first goal which was a power play goal at 17:30 of the first period. While turned out to be the only goal Calgary would need; it was Tambellini who would seal the win when he scored his 8th goal of the season also on the power play at 12:51 of the 3rd period. Tambellini is 4-2-6 in his last 3 games and all 6 of those points have come on the power play. In fact 5 out of Tambellini's goals have been on the power play. Overall Tambellini is now 8-11-19 in 15 games. A stick tap to the Kootenay Ice goalie as Mackenzie Skapski (NYR 2013 6th) won his 9th straight start as Skapski stopped 32 out of 34 shots as the Kootenay Ice defeated the Lethbridge Hurricanes 4-2. The win enables the Ice to pull to within 3 points of 4th place Medicine Hat in the WHL's Eastern Conference playoff race. Skapski had it rough during the first half of the season and to his credit, he kept plugging away and it is finally paying off as Skapski wins his 20th game (20-13-2-1) and lowered his goals against to 2.73 and improved his save percentage to 0.917. As I mentioned earlier, there needs to be a way to show when a solid defensive minded defender has a solid game as Griffin Reinhart (NYI 2012 1st) was just a monster in helping his Edmonton Oil Kings win their 11th straight game 5-1 over the Vancouver Giants. The 2nd star of the game, Reinhart was a big reason why the Giants went 0 for 7 on their power plays as Reinhart was disrupting every attempt for the Giants to generate offense. Reinhart had a secondary assist but his defense is so above the rest of the WHL players. Reinhart is 3-14-17 on the season. One night after Cristoval Nieves (NYR 2012 2nd) and his 10th ranked Michigan Wolverine teammates helped their coach become the 4th winningest coach in Division One hockey, the same team gave away a game to the Penn State Nittnay Lions losing 4-0. Penn State who entered this game 0-9 in the Big Ten earned their very first conference win by just outworking and out playing Michigan. Nieves other than hitting the crossbar on a shot in the 2nd period looked very frustrated out there as nothing seemed to work for him. While his coach Red Berenson is sticking with him despite this disappointing season, there comes a time when maybe Nieves needs to sit a game out. Nieves didn't get credited for hitting the crossbar but he was an -2 as well. Troy Donnay (NYR 2013 UFA) was scoreless in Erie's 7-2 win over London but it really is unfair that a guy has a strong defensive game winds up looking invisible because all the stat sheets list all the offensive stats. Erie leads the OHL in defense because they have a solid blueline, a blueline that Donnay patrols quite well. Anthony Duclair (NYR 2013 3rd) saw his 9 game scoring streak come to an end as his Quebec Remparts dropped a shootout decision to the Victoriaville Tigres 3-2. Duclair who was 11-13-24 during his streak has only one glaring weak spot and that is he can't score on the shootout. Duclair missed for the 6th time in 7 attempts this season which is crazy considering how many times Duclair has scored on breakaways this season. Steven Fogarty (NYR 2011 3rd) was scoreless as his Notre Dame Fighting Irish pulled off a miraculous comeback in the game's final 1:08 to steal a 3-2 win from the Maine Black Bears. Fogarty was moved up to first line center for this game did not even get off any shots as Notre Dame was bailed out of losing their 4th straight game thanks to Brian Rust scoring 2 goals 24 seconds apart in the game's final minute. Ryan Graves (NYR 2013 4th) was scoreless, a -1 on 2 shots with 1 hit as his Val-d Or Foreurs edged the Chicoutimi Saguenéens 4-3. The win helped the Foreurs to jump into 6th place in the QMJHL and clinch a QMJHL playoff spot. Victor Crus Rydberg (NYI 2013 5th) was scoreless as his Plymouth Whalers defeated the North Bay Battalion 5-1. Jesse Graham (NYI 2012 6th) was scoreless and a -2 as his Saginaw Spirit gave up 4 third period goals to lose to the Sault Ste. Marie Greyhounds 6-5. Loic Leduc (NYI 2012 4th) was scoreless with 2 minor penalties to show for his efforts as his Rimouski Oceanic needed the shootout before earning a 1-0 shootout win over the Halifax Mooseheads. Neither Eamon McAdam (NYI 2013 3rd) or Stephon Williams (NYI 2013 4th) saw action for their respective teams.